When I was pregnant, I was lucky enough not to have morning sickness or much in the way of cravings. Other than grapefruit (in August, when it is not easy to come by! ), I really just wanted sopapillas. I blame this one a bottle of Burt’s Bees lotion I had just bought that was scented with honey and orange, and made me think of sopapillas every time I used it. Unfortunately, the Mexican restaurant we frequent didn’t offer them, so I had to do without and just keep sniffing my honey-scented fingers. 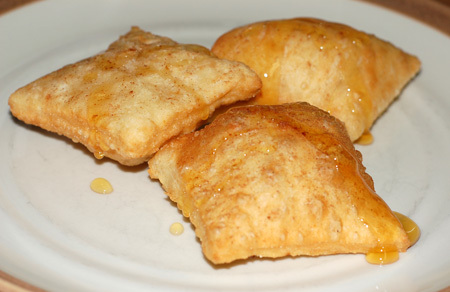 If I had known how easy sopapillas are to make at home, I would have saved myself the torment and just made them myself. I made them this year to celebrate Cinco de Mayo, and they took me right back to my childhood, using the little vinyl flag at Casa Bonita to request more free sopapillas. My little boy may have never been there yet, but he loved his mama’s sopapillas, for dessert and also possibly for breakfast the next day. (What? They’re just like doughnuts, and despite the fact that I cut the recipe in half, there were way too many to eat in one sitting.) The recipe itself is incredibly easy, really just a leavened variation on the tortilla dough I make all the time these days. You could certainly use them for savory applications, but I really only want to eat them with a dusting of cinnamon and lots of local honey. In a large bowl, stir together flour, baking powder, and salt; use your fingers to cut the shortening into the flour until thoroughly incorporated. Stir in water; mix until dough is smooth. Cover and let stand for 20 minutes. Roll out on floured board until 1/8 to 1/4 inch thick. Using a pizza cutter or sharp knife, cut into 3 inch squares. Heat an inch or so of oil to 375 degrees F (190 degrees C) in a heavy pot or cast iron skillet; don’t let the oil fill the pan more than halfway. A few pieces at a time, fry dough until puffed and golden brown on both sides. Drain on paper towels, sprinkle with cinnamon if desired, and serve hot, with honey or desired garnish drizzled into the pocket. Makes 18-20 sopapillas.